It has been said that men need history, that it helps them have an idea of who they are. And, I would add of who they are not. Thus, it is to history that I must first turn in narrating the reality, which nurtures this article. It does not pretend to be a scholarly work for it is too bound to life to boast of intellectual sophistication. It is bound to a life of solitude and a grief wrought by apathy and incomprehension. A source of much of this emptiness is, strangely enough, found in the books of law under the rubric of federalism. What does one’s solitude and grief or the apathy of others have to do with it? Where lays the enigma? They lie in the fact that in the name of misunderstood or misapplied versions of federalism this Island has become a breeding ground for strife, confusion and conflict. That translated into human terms, means solitude and frustration for many. The underlying message of this article has been sent out by others be­fore me: a better account has to be taken of the facts surrounding the Puerto Rican reality. The misconceived notion of a sovereignty-oriented federalism, which is advocated and manipulated by some, lends itself to the perpetuation of the unequal treatment accorded to the island. Puerto Rico is neither sovereign nor federalist. Some act and speak as if it were. That does not change its reality. We cannot hide any longer behind the grandiose phrases which are used to describe Puerto Rico— federal rela­tions such as “unparalleled relationship, unique, sui generis, a new di­mension in American federalism”—for every time that we pass on to a new generation the unresolved burdens inherent in our present relation­ship with the United States the possibility of making the social, political and moral decisions that have to be made becomes more and more re­mote. In the first part of this article we shall trace the history of federal-State relations to follow the growth of the changing concept of American fed­eralism from colonial times to the recent version of a process-oriented federalism. The second part will deal with some of the problems of a people whose county is still an unincorporated Territory of the United States and who should by now be tired of the rhetoric of sovereignty and the imagery of federalism. There are many theories and different versions of federalism. The American conception of federalism is no exception. It has been charac­terized in different ways by different people during the various stages of its growth. American legal decisions and scholars have talked, for exam­ple, about dual federalism, “Our Federalism,” a state sovereignty approach to federalism, cooperative federalism, horizontal federalism, interstitial federalism, a process-oriented federalism; “separate spheres” federalism, an interactive federalism, and a new federalism. In order to judge the form to be given to this institution, it will be proper to take a view of the ends to be served by it. These were first to protect the people against their rules: secondly to protect (the people) against the transient impressions into which they themselves might be led. A people deliberating in a temperate moment, and with the experience of other nations before them, on the plan of govt. most likely to secure their happiness, would first be aware, that those charged with the public happiness, might betray their trust. An obvious precaution against. This danger wd. be to divide the trust between different bodies of men, who might watch and check each other. In this they wd. be governed by the same prudence which has prevailed in organizing the subordinate departments of govt. where all business liable to abuses is made to pass thro’ separate hands, the one being a check on the other. The state governments, I think, will not be endangered by the pow­ers vested by this Constitution in the general government. While I have attended in Congress, I have observed that the members were quite as strenuous advocates for the rights of their respective states, as for those of the Union. After all, sir, we must submit to this idea, that the true principle of a republic is, that the people should choose whom they please to govern them. Representation is imperfect in proportion as the current of popular favor is checked. This great source of free government, popular election, should be perfectly pure, and the most unbounded liberty allowed. Where this principle is adhered to; where, in the organization of the government, the legislative, executive and judicial branches are rendered distinct; where, again, the legislature is divided into separate houses and the operations of each are controlled by various checks and balances, and, above, all, by the vigilante and weight of the state governments,—to talk of tyranny, and the subversion of our liberties, is to speak the language of enthusiasm. This balance between the national and state governments ought to be dwelt on with peculiar attention, as it is of the utmost importance. It forms a double security. If one encroaches on their rights, they will find a powerful protection in the other. The continuous existence of the states as governmental entities and their strategic role in the selection of the Congress and the President are so immutable a feature of the system that their importance tends to be ignored. Of the Framers’ mechanisms, however, they have had and have today the larger influence upon the working balance of our federalism. The actual extent of central intervention in the governance of our affairs is determined far less by the formal power distribution than by the sheer existence of the states and their political power to influence the action of the national authority. Closely tied to the element of representation is that of the involvement of the citizens and the communication, which is, or ought to be, maintained between the national government and the people. MacMahon points out that the “essential ingredient in federations (as distinguished from looser forms of union) is that their central organs are to some extent directly in contact with individuals, both to draw authority from them through elections and also for the purpose of exacting taxes and compliance with regulations.” This contact with the citizenry also gives the people a degree of control in the national governmental system. The people know themselves to be the source of the government’s legitimacy. The force of the people of each constituent polity is added and is bound to that of the people of every other constituent polity in fulfilling the desire to unite independent, diverse communities into one single polity. All of these features are an integral part of the many facets of federal­ism advocated in the United States, which range from the “original constitutional conception of federalism” addressed by Professor Kurland to such atomized versions as “Justice Rehnquist’s federalism.” The characteristics I have mentioned are generally not discussed at any length in scholarly works on federalism because they are simply the given premises of their inquiry. It is, of course, taken for granted that sharing of power, division and diffusion of power, representation, equal­ity, citizen participation in the national political processes, and perma­nence are part of the federalist formula, more specifically, of the Ameri­can brand of federalism. It would seem naive to even question this. The need, or better stated, our need for stacking the building blocks of the pyramid will become obvious in our later discussion. Now, however, it is important to consider, if briefly, the struggle for the meaning of American federalism, which for the most part has turned on the preference of, state over national rights, or vice versa, until the most recent formulation which ties American federalism to the nation’s political pro­cesses. We propose that this development will support the position taken in this article that American federalism, in its historical dimension and in its present manifestation, is not only irrelevant to the Puerto Rican society but also alien to it. As stated earlier, federalism in the American experience has been characterized in different ways, depending on the advocate’s personal preferences in tilting the balance in favor of the states or of the nation. In this struggle between the votaries of states’ rights, on one hand, and the proponents of a vigorous national government, on the other, lies also the struggle for the meaning of federalism. Holmes said that it was enough for the Founders “to realize or to hope that they had created an organism; it has taken a century and has cost their successors much sweat and blood to prove that they created a nation.” The sweat and blood that went into building that nation is sometimes ignored by those who embark upon hair-splitting theories and sub-theories of federalism essentially based on the idea of state sovereignty. The struggle, as Professor Field acknowledges, is in some ways a political one. It has been a tortuous road, the one leading from a sovereignty-controlled view of federalism to the functional vision of federalism, which was adopted by the Court in García v. San Antonio Metropolitan Transit Authority, 469 V.S. 528 (1985). We shall look at several of the many costumes that federalism has worn and cast aside. The scenario for the display of the costumes has largely been, of course, the judicial arena, if only because of the pre-eminence of the American judiciary as expositors of the concept. The two most prominent theories of federalism have been dual federalism and cooperative federalism. Although the Supreme Court for many years relied on the theory of dual federalism in adjudicating issues of state/federal relations, it slowly moved away from that conception, passing through several stages. Before National League of Cities v. Usery, the modern Court interfered little with national political power thus leaving national political authority largely unrestrained. In this 1976 opinion, however, it revived the idea of placing restraints on the exercise of national power on the states only to abandon it nine years later, in García v. San Antonio Metropolitan Transit Auth., for deference to the national political processes as protectors of the states’ interests. Under the theory of dual federalism, the states were regarded as “integral units, equal with and antagonistic to the federal government, while also retaining their own impregnable spheres of authority.” This image of two antagonistic and inherently equal sovereigns diminished with the passage of time and due to the aggrandizement and consolidation of national power, and the states came to be regarded instead as semi-sovereign bodies in contrast to the larger political community—or nation—which came to be viewed as the sovereign. But the idea, derived from debates during the ratifying conventions, that the state and the national governments were distinct and separate, that each was instituted with different powers and for different purposes, placated those who feared that the autonomy, even the life, of the states was placed in jeopardy by the birth of the new national government. So, even the Federalists, who favored a strong and powerful national government, engaged at times in the sovereignty rhetoric to allay the fear of their opponents, or perhaps also, to sink their roots in patriotic turf. In the modern period the competition between theories of dual and cooperative federalism is no longer the issue. A cooperative pattern began to emerge before the Constitution itself, grew during the Federalist era, and continued side by side with the dual pattern in the long period between 1800 and 1913. After 1913, and especially after 1935, it became supreme. The cooperative idea cultivated new programs and added new dimensions. Judge Wisdom calls cooperative federalism “the polite term for that expansion of national authority when there was an overlapping of national and state authority, some increase in state authority, and considerable bypassing of state legislatures and centralized state authorities in program rendering federal aid to cities and local governments.” Professor Redish, for his part, refers to “the euphemistic nature of the ‘cooperative’ label,” arguing that its proponents disregard “the significant conflict and tensions that have arisen over the years between state and federal systems.” Redish also rejects the dual federalism theory as no longer representing “a valid analysis of American federalism, if indeed it ever did.” Redish, instead, places the “interactive” label to his choice of federalism theory to contrast it to the dual model. He claims it is “[t]he true alternative to the rigid, parallel function theory of dual federalism… more neutral than cooperative” because it “recognizes the inevitable intertwining of the state and federal systems as they both go about the business of governing.” He views the interaction of the respective sovereigns to be combative at times yet at other times their actions will be supplementary to one another. Translating this to the area of judicial federalism, he submits that in the judicial context the combative and cooperative elements of interactive federalism are clearly evident for sometimes “the interaction of state court with federal law will undermine an overriding federal legislative scheme, while in others cooperative interaction will be required to facilitate attainment of federal policies.” The message of his article is that recognition of the same principles of interaction that underlie his model or perception of American federalism as a political theory should dictate that the Supreme Court exercise a more expansive role in reviewing state court decisions than even the practice adopted in Michigan v. Long, that is, by reviewing state decisions grounded exclusively on state law if the state decision substantially relies on federal law or incorporates federal law by reference. There are many more perceptions of federalism, also geared to the no­tion of sovereignty that are advocated by leading commentators. Raoul Berger, for example, writes that the anti-Federalist attachment to State sovereignty “was deeply rooted in human nature and the colonial experience, and had a rational basis.” He speaks of the “inviolable” spheres of state governments which coexist beside a limited federal sphere and says that it was the Founders’ design that “[w]ithin each sphere…the respective governments were to enjoy exclusive jurisdic­tion.” A dual or two-sovereignty federalism requires, in his view, care­ful tracing to draw the boundaries between the two spheres, arguing that “[w]e may not wash our hands of the task of tracing the boundary if only because Madison assured the Ratifiers that the federal jurisdiction ex­tends to certain objects only, and leaves to the States a residuary and inviolable sovereignty over all other subjects.” He makes repeated refer­ence to the Framers’ utterances on devotion to self- government and their solicitude for local, internal affairs of the states in performing his task of boundary tracing: functions undoubtedly local as distinguished from transactions that cross state lines. This theme of jurisdictional line drawing was further developed, from a wholly different perspective, by Professor Althouse in an article in which she urges that the “[s]tates are not inviolable spheres of sover­eignty,” that judicial doctrines of federal jurisdiction will operate “to adjust—to redraw—the boundary that circumscribes the states’ inde­pendent functioning.” The states’ boundaries are mutable, though sepa­rate, and the state must find the ways to form its own sphere. She adopts Justice Powell’s doctrine in Pennhurst, which “awards separateness only to the state that earns it.” Althouse’s proposal is a vision of federal­ism based on a separate spheres theory, which holds that the national interests are best served when the states function effectively. How­ever, the states have to win or earn their separate spheres by, for exam­ple, offering genuine alternatives to the enforcement of federal law. It is a functional approach to federalism derived from Justice Black’s formu­lation in Younger that there is a federal interest in effectively functioning states. The author, like Justice Black in Younger, disclaims any belief in blind deference to States’ Rights, noting that “federalism is not, funda­mentally, about displays of respect” and that “[a]n unbroken flow of politesse would reflect the states’ rights belief disavowed in Younger.” Thus, there is a need to promote an independent functioning in the states which, in turn, will warrant deference to them but “[i]t is not that the states deserve autonomy simply because they are states, but ra­ther that it is appropriate to leave the states alone, to accord them a `sepa­rate sphere’ because the `National Government will fare best’ that way.” The states must build for themselves their separate spheres and “the state that fails to function effectively should suffer federal interference.” This functional analysis of federalism contemplates federal interference when the state falls behind and fails to apply or misapplies federal law yet it advocates restraint when the state is trying to find in its own law alternative solutions to the problems addressed by federal law. It is one thing to recognize the authority of Congress to enact laws regulating individual business necessarily subject to the dual sovereignty of the government of the Nation and of the State in which they reside. It is quite another to uphold a similar exercise of congressional authority directed, not to private citizens, but to the States as States. We have repeatedly recognized that there are attributes of sovereignty attaching to every state government which may not be impaired by Congress not because Congress may lack an affirmative grant of legislative authority to reach the matter, but because the Constitution prohibits it from exercising the authority in that manner. Expanding on Justice Brennan’s charge that the Court’s state sov­ereignty doctrine in National League of Cities is an “abstraction with­out substance,” Professor Michelman reasons that “a state’s sovereignty, as conceived in National League of Cities, can consist neither in a notion of the state as the object of political loyalty and legitimate arbiter, nor in a notion of the state as the embodiment of political choice about the basic `structuring’ of roles and functions in civil society.” This, he believes, is confirmed by the fact that National League of Cities entitles municipali­ties to the protective mantle of state sovereignty, although municipali­ties had been denied immunity from suit in federal court and no reason is given for protecting them also from the exercise of congressional commerce power. For Michelman, what is sovereign about municipali­ties is not their legislative position or significance, but the ‘states’ cus­tomary reliance on them to provide for the interest of citizens in receiv­ing certain important social services. Thus he concludes that the Court’s notion of sovereignty in National League of Cities is a functional one which regards “the state’s service role as crucial to its constitutional place” and that the Court in National League of Cities was using sover­eignty “to stand for nothing more nor less than the state’s role of provid­ing for the interests of its citizens in receiving important social services. This notion of sovereignty reflects a specialized meaning of the concept as opposed to the common meaning of states’ rights. It has no political content and expresses no greater deference to the state governmental activity of a political nature than to private activity unless it falls into the various categories of functions labeled by the Court in National League of Cities as integral, typical, traditional, or essential. This conclusion and its underlying rationale have singular pertinence to the view, contained in the Federalism Proposal, that the Supreme Court should not adjudicate constitutional questions of national power versus states’ rights. Cases that allege an excessive act by the central government are presented to the Court only after the act has attained the broad consensus that is required to overcome the inertia and the various negative features of our national lawmaking process. Legislation affecting states’ rights must also clear the imposing hurdle of active congressional concern for state sovereignty, a solicitude…that cannot be attributed to the threat of judicial invalidation. For, except in a few notable instances, the Court’s definitions of national powers have afforded the political branches exceedingly broad discretion in this area. In contrast to the undemocratic aspect of malapportionment, which permits minorities to impose laws on the majority, national legislation affecting states’ rights must have the widespread support of those affected. Under these conditions, the need for judicial review is at its lowest ebb. This was the proposal to which García responded in 1985. And so “the ever whirling wheels of American federalism,” to use Judge Wisdom’s vivid phrase, turned back to the old reliance on the political processes to protect the states against intrusion by the central organs. In doing so, the Court accepted the more passive role which Choper and Wechsler suggested, bowing to the Congress as the chief umpire in the questions of state-national relations, at least as far as the exercise of power under the Commerce Clause was concerned That acceptance can only be described as enthusiastic given the Court’s complaint that the self-imposed task which originated in National League of Cities of distinguishing between traditional versus non-traditional governmental functions for purposes of determining state immunity from federal regulation had become impossible to perform. Apart from the limitation on federal authority inherent in the delegated nature of Congress’ Article I powers, the principal means chosen by the Framers to ensure the role of the States in the federal system lies in the structure of the Federal Government itself. It is no novelty to observe that the composition of the Federal Government was designed in large part to protect the States from overreaching by Congress. The Framers thus gave the States a role in the selection both of the Executive and the Legislative Branches of the Federal Government. The States were vested with indirect influence over the House of Representatives and the Presidency by their control of electoral qualifications and their role in presidential elections. U. S. Const., Art. I, Section 2, and Article II, Section 1. They were given more direct influence in the Senate, where each State received equal representation and each Senator was to be selected by the legislature of his State. Art. I, Section 3. The significance attached to the States equal representation in the Senate is underscored by the prohibition of any constitutional amendment divesting a State of equal representation without the State’s consent. Art. V.
If the wage and hour provisions of the FLSA are applied to state and local governments in their capacities as employers, there is an additional effect on the states: the costs of providing public goods and services are increased. Nonetheless, the same political checks operate and Congress is politically accountable because the regulations also apply to private employers, and state interests are vicariously protected by the impact of the FLSA on private employers. Since national intrusion on the states is limited by the application of the FLSA standards to both private and public employers, judicial protection for the States in NLC was not warranted. And, in further elaborating his theory of political accountability as a means of preserving states’ interests, he strikes the same chord as the García decision that judicial interference will require a failure of the political process at the national level. Thus, political checks and political accountability, and not simply the representation of state interests in Congress by repre­sentatives elected from the states, are the political safeguards of federalism; they justify deference to the national political process and protect the states’ role as political communities in the federal system. When political checks make Congress politically account­able, intrusion on the independence of state political decision-making is permissible; that is, the political safeguards are suffi­cient. Conversely, when Congress is not politically accountable, courts should protect state interests in political decision-making. The critics of García have attacked the adequacy of the modern political process in the nation asserting that in the real world these are insufficient. Others have denounced García as allowing and encouraging the imperialistic expansionism of the Federal Government over the States. In a way, it is ironic to end our discussion of American federalism on this note. For if there is such a fear, despite the existence of the States as diverse political communities which are an integral and respected part of the second larger political community —the nation—and despite their full participation in the selection and composition of the federal government, what can be expected of those who have stood by the wayside for almost a century? Who-what, then, is Puerto Rico? Has it ever been a part of the balance in intergovernmental relations that Hamilton spoke about? Does it play any role in the national political process to which the García Court de­ferred the protection of the states against congressional encroachment? Where does it fit in the political structure of an American federalism? I could give the “yes/no” answers that usually sprout in any inquiry of Puerto Rican-federal affairs. The answers are “mixed,” they say, or, “they depend on the circumstances.” Yet, when we trace the basic ideas under­pinning the growth, the process, the constitutional scheme, the political arrangement, if you will, known as federalism, an honest mind can only conclude that federalism is a myth in Puerto Rico. It is not honest to speak of modern Puerto Rico as a new dimension in federalism while at the same time the very existence of that new reality has to be conditioned to obtaining such essentials of a federalist society as the participation in the process of federal legislation. You can go through reams of papers on scholarly constitutional analysis of Puerto Rican-federal relations and all will leave you with the bitter taste of its anomalous situation, called by some its “unique” situation. Federal-state relations have generated in the United States a jurispru­dence of federalism. Puerto Rican-federal relations have, in turn, created a jurisprudence of colonialism, with all the mixed signals, the evasive­ness, the blooming rhetoric and “the juggling of words” that must be put in when in the dawn of a new century you still have judges dealing with the problems of a colony while at the same time making believe they are not. It is pitiful. And, it is painful. The economic advantage of permanent union with the United States made tolerable a political settlement that left the Puerto Rican, ‘Mr. Nobody from Nowhere,’ imprisoned in a constitu­tional limbo as an unincorporated territory. `We are and we are not an integral part of the United States. We are and we are not a for­eign country. We are and we are not citizens of the United States…The Constitution covers us and does not cover us… it ap­plies to us and does not apply to us.‟ These ambiguities were to haunt Puerto Rico’s relationship with its new master; they are still unresolved. Constitutional relations between Puerto Rico and the United States are not based on a system of logically consistent principles. Purposes Puerto Rico is treated as if it were a state of the Union, for others as an unincorporated territory and for still others as a jurisdiction uniformly incorporated into the network of national legislation. Congress, which is empowered under the Territory Clause of the Constitution, U.S. Const., Art. IV, Section 3, cl. 2, to `make all needful Rules and Regulations respecting the Territory… belonging to the United States’ may treat Puerto Rico differently from the States so long as there is a rational basis for its actions. The rationality of the congressional action was grounded on the three factors listed before, without further inquiry or explanation. …the Court suggests today, without benefit of briefing or argument, that Congress needs only a rational basis to support less beneficial treatment for Puerto Rico, and the citizens residing there, than is provided to the States and citizens residing in the States. Heightened scrutiny under the equal protection component of the Fifth Amendment, the Court concludes, is simply unavailable to protect Puerto Rico or the citizens who reside there from discriminatory legislation, as long as Congress acts pursuant to the Territory Clause. Such a proposition surely warrants the full attention of this Court before it is made part of our constitutional jurisprudence. In his article on federal financing in Puerto Rico, Professor Richard B. Cappalli, commented that “[t]he price paid for not being a federated State is that Congress can and does discriminate against Puerto Rico in federal grant programs.” He compared ceilings imposed in 1950 and in 1967 in federal welfare payments to Puerto Rico. Referring to the 1950 ceiling, he observed that “[a]n absolute limit of 4,250,000 in federal payments to Puerto Rico under all the welfare categories was inserted; in addition, the federal share of the welfare program in Puerto Rico could not exceed 50%, whereas in the States it could reach as high as 75%.” According to statistics used by Cappalli, in 1967 the ceiling still existed, although it had been raised to $9.8 million and the Puerto Rico’s allotment amounted to 0.3% of the total amount of federal assistance payments throughout the United States, lower than the allotment in 1950, which represented 0.4% of the total. The author suggested that [t]he specter in Puerto Rico of monstrously long welfare rolls sponsored by the federal treasury” was one of the reasons for the severe limitations on federal welfare assistance to Puerto Rico. As recent as March 1988, the matter of limitations on the amount of funds; that Puerto Rico receives under federal assistance programs was addressed by the White House Task Force on Puerto Rico in response to questions posed by the Subcommittee on Insular and International Affairs, U.S. House of Representatives. First, there was concern that, given disparities in prevailing wages between the U.S. and Puerto Rico, full extension of the programs could interfere with work incentives and operation of an effective labor market. Second, family structure, social institutions and governmental programs vary from those on the mainland and programs designed for the fifty states may have negative consequences when applied to Puerto Rico. In addition, there was concern with the cost of extension of these programs to Puerto Rico—in all likelihood about $1 billion a year. The discriminatory treatment accorded Puerto Rico has resulted not only in its exclusion from the federally funded Supplemental Security Income program (SSI) but also in the loss of approximately $78 million due to the funding ceiling of $72 million placed on the Aid to Families with Dependent Children program and a loss of approximately $325 due to the $74.4 million limitation on the Medicaid assistance to the needy in Puerto Rico. The key point about Puerto Rico’s place in the American constitutional system is that no word other than ‘colonialism’ adequately describes the relationship between a powerful metropolitan state and an impoverished overseas dependency disenfranchised from the formal lawmaking processes that shape its people’s daily lives. We do well to speak plainly and accurately -and without embarrassment- about the facts as they are. The truth is that in spite of the many expressions by the United States in favor of free determination, that right has never been rec­ognized to Puerto Rico beyond the realm of rhetoric. We have seen that during different stages of the recent constitutional history of this country each of the three status formulas has for some time dominated public opinion. The people of Puerto Rico, conse­quently, requested at different times during this century admission in the Union as a federal state or at least as an incorporated terri­tory. It was not pleased. It requested independence. No bona fide offer was made either. It sought full autonomy. It was consistently denied, although from time to time some reforms were effectuated, mostly modest ones, to the regimen. These habits of a drifting im­perialism, which on so many occasions have tainted the relations between the United States and Puerto Rico, have made the so­lution of the status problem unnecessarily difficult. It resembles a state in that, while its elected representatives have a measure of control over its domestic concerns, many important issues are settled by federal laws; it differs from a state in that it has no representative in the body—the United States Congress—that makes those laws. The relationship between Puerto Rico and the United States has never become, as Henry Stimson once ar­gued it should, “analogous to the present relation of England to her overseas self-governing territories;” the British Commonwealth is a loose association of sovereign states—thus, for example, the Irish Republic, then a member of the Commonwealth, did not de­clare war in 1939. This option would not have been open to the Commonwealth of Puerto Rico. Unlike citizens of the self-gov­erning dominions, but like the British citizens of the colonies who were involved in a war declared by a Parliament in which they were not represented, the American citizens of Puerto Rico have been automatically involved in wars declared by president and Congresses in whose election they played no part. If the term Commonwealth is meant to imply any resemblance to a member state of the Commonwealth, it is delusory, hiding a colonial relationship in which the metropolitan power legislates for the colony and controls its defense and foreign policies. Puerto Rico is still not a part of the ‘United States’ for all constitutional purposes; the island and its people are still subject to the laws and regulations adopted by the political branches of the national government before which they appear only as supplicants; and that national government retains virtually unlimited discretion to determine whether or how the island will fit into national policy. It is thus true, as Torruella argues that the island’s basic political status has not changed since the turn of the century and the development of the doctrine of territorial incorporation. Most of the authors quoted above could rightfully be called the critics of Commonwealth status. The fact remains, however, that the advocates of that political status also concede the basic shortcomings of that formula, to wit, the lack of representation in the national political processes which directly affect all Puerto Ricans, the partial application of the United States Constitution resulting from the distinction between fundamental/nonfundamental rights, the unequal treatment suffered time and again which is patent in cases such as Torres and Rosario, the very weakness of a political creature that must abide and abide without ever casting a vote to make those by whom it abides more sensitive to its needs and interest. Its defenders have downplayed these realities, calling it a new dimension of federalism. This is what Carl Friedrich, for example, called it, stating that it “conceivably provides a striking model for future developments in the sphere of the liberation of colonial peoples who do not wish or may not be able to organize themselves as independent political communities.” I venture to say that only a people with a colonial history as long as ours can perceive the trickery enclosed in those words. It is more of the word spinning that we are accustomed to. The fact that all these activities are carried forward by officials appointed without the consent of Puerto Rico indicates the severe limits within which autonomy is at present defined. They suggest the importance of radical alterations in the federal relations we believe to be necessary before Puerto Rico can be considered truly self-governing. And, making his own list of shortcomings in the present relationship, which serve at the same time to support his claims of culmination of the Commonwealth status, he said. In the future compact the model of the states should no longer govern. The States are members of the Union, their citizen’s vote for the President and have full congressional representation. Puerto Rico is not a member of the Union; its citizens do not vote for the President and are represented in Congress only by a Resident Commissioner with the right to speak but not to vote. Indeed, Puerto Ricans hope that Congress will understand our claims… And, of course, the culmination of the Commonwealth status is politically indispensable. The continuation of the status quo will be harmful for the dignity of Puerto Rico and for the international reputation of the United States. More important, the Congress cannot ignore the demands of a community, which has shown absolute loyalty to the American citizenship, to the democratic institutions contained in the Constitution of the United States, and to the principles of liberty, which make great this country. Though the formal title has been changed, in constitutional theory Puerto Rico remains a territory. This means that Congress contin­ues to possess plenary but unexercised authority over Puerto Rico. Constitutionally, Congress may repeal Public Law 600, annul the Constitution of Puerto Rico and veto any insular legislation, which it deems improper. From the perspective of Constitutional law, the compact between Puerto Rico and Congress may be unilaterally altered by the Congress. The existing federal-insular relationship has within it the seeds of two tensions; one is symbolic, while the second involves government without representation. With time the tension between political reality and Constitutional, theory, between the possession of home rule and the status of a territory, may grow to unmanageable proportions. Pan of the reality of freedom is feeling free. Indeed, man’s history chronicles innumerable occasions when the symbol of freedom outweighed all political considerations. Since men live by and for symbols, a substantial degree of self- determination may not compensate for a badge of an inferior status. Nor is the badge merely symbolic, since Puerto Rico is permitted no politically effective role in the making of national policy—even with respect to federal policy, which affects the island deeply and directly. A people with democratic convictions can hardly countenance government without representation at the national level as a permanent political condition. It is to be hoped that Congress will not be slow in recognizing Puerto Rico’s symbolic as well as its practical and democratic need for effective participation at the national center of power. Puerto Rico has thus not become a State in the Federal Union like the 48 States, but it would seem to have become a State within a common and accepted meaning of the word. Instead of participation in the federal legislative process, we have a Resident Commissioner without vote in Congress, lobbying efforts, and the memoranda of law firms. Instead of Congressional concern and awareness originating from the accountability of Congress to the States and their constituencies, we have the ebb and flow of whatever power and favor can be obtained from contacts and friends in Washington. How does this fit into the framework of built-in guarantees of the federal system, which led the Court in García to step aside unless there was a failing in the political process at the national level? The obvious answer is that it does not. The basic tools are missing. Puerto Rico does not have a place in the spheres that the García Court found capable of self-protection. A body politic, which has no participation in the composition and selection of the national government, whose citizens have virtually no political participation in the national processes, and where, consequently, there is no accountability to it, can be called many things, except a part of a federalist plan. The organization and political configuration of Puerto Rico simply lack the structural elements of the American federalism. Wasn’t it after all the desire for political participation and for freedom of choice, which joined the hands of those who wrote the Charter? Whatever the imagery or the legalesse, Puerto Rico is not a part of American federalism, be it crippled or blooming. Let there be no doubt. No one who has lived in this Island long enough to know it can ignore its painful reality. Some accept it out of inertia, others because of sheer exhaustion, still others because of cowardliness or personal gratification while the Lowells of our time thrive on the endless bickering that saps our energy and ruins our peace. * U. S. District Judge for the District of Puerto Rico. That is, concept of federalism that holds that there are two sovereign, independent and antagonistic, and that government flourishes by their competition with each other as equal part­ners. Justice Black in Younger v. Harris, 401 V. S. 37, 44 (1971), referred to the “ideals and dreams of ‘Our Federalism,’ “stating that “[t]he concept does not mean blind deference to ‘States’ Rights’ any more than it means centralization of control over every important issue in our National Government and its courts,” but rather represents “a system in which there is sen­sitivity to the legitimate interests of both State and National Governments, and in which the National Government, anxious though it may be to vindicate federal rights and federal inter­ests, always endeavors to do so in ways that will not unduly interfere with the legitimate activities of the States.” Professor Redish has raid that “in Younger the Court attempted to elabo­rate on the theoretical bases for the bread deference given to the states under the newly-coined title of ‘Our Federalism;’ a task which previous Courts had declined to undertake,” and that “[w]hat Justice Black did not fully explain, however, is exactly which state interest or institutions were intended to be served by the extreme judicial deference dictated by ‘Our Fed­eralism.’” M. Redish, Federal Jurisdiction: Tensions in the Al­location of Judicial Power (The Michie Company 1980) at pp. 297-98. This conception of federalism reflects the notion that the dates ere separate, inviolable spheres whose domains must be free from federal interference. Cooperative federalism views the various states as cooperat­ing with the federal government and supplementing each other. See Pollock, Adequate and Independent State Ground as a Means of Balancing the Relationship Between State and Fed­eral Courts, 63 Texas L. Rev. 978, 992 (1985) (“a federalism in which dates look to each other for guidance” resulting from state court departure from federal court decisions). The belief that federal law is interstitial in nature and builds upon legal relationship that the states have established. The view that the fundamental limitation on the enroll of congressional power over the states is one of process and that any restraint must and ice justification in the procedural na­ture of that limitation. A construct of federalism based on the functioning of the dates within the federal scheme, which proposes that the states build for themselves separate spheres that federal court will respect. A theory of federalism that rejects the dual model and relies instead on the interactions of the state and federal systems. An expansion of the state-sovereignty theme, which urges state, courts to look to their own constitutions as a source of individual rights. See, S. Abrahamson, Reincarnation of State Courts, 38 Southwestern L.J. 951 (1982). Anderson, William, Intergovernmental Relations in Review (University of Minnesota Press, 1960), p. 5. Livingston, William S., Federalism and Constitutional Chants (Oxford University Press, 1956), p. 2 (arguing that fed­eralism le a function not of constitutions but of societies). Max Ferrand (ed. ), The Records of the Federal Convention of 1787, (New Haven), Yale University Press, Vol. I, p. 421. The Debates in the Several! State Constitutions on the Adop­tion of the Federal Constitution, Vol. II, p. 199 (J. Elliot, ed. 1937). Supra, note 14, at 257. Wechsler, The Political Safeguards of Federalism: The Role of the States in the Composition and Selection of the National Government, 54 Colum. L. Rev. 543, 544 (1954). It is Professor Wechsler’s thesis “that the existence of the states as governmental entities and as the sunrise of the standing law in itself the prime determinant of our working federalism, coloring the nature and the scope of our national legislative) process from their inception.” Id. , at 648. Arthur W. MacMahon, Federalism: Mature and Emergent (Doubleday Co., Inc., New York, 1965) p. 4. Edward S. Corwin considers that the federal system has “shifted base in the direction of a consolidated national power in response to war, economic crisis and an altered outlook upon the duty of govern­ment, yet affirms that “the structural features of our Federal System still remain what they have always been.” See, E. Corwin, The Pass­ing of Dual Federalism, 36 Va. L. Rev. 1, 3 (1950). See, P. Kurland, Federalism and the Federal Courts, Benchmark, Vol. II, No. 1, January-February 1986. Professor Powell’s position is that Justice Rehnquist‟s theory of federalism, which relies on the idea of sovereignty, fails in its connection to history, arguing that “The evidence is strong that the Framers intended to establish a vigorous national government for the purpose of securing the liberties of the sovereign people.” Id. , at 1369. See, Edward S. Corwin, The Constitution of the United States of America, Analysis and Interpretation, Introduction to the 1952 Edition, Wash., D.C., U.S. Government Printing Of­fice (1964), p. 4 (“Federalism in the United States embraces the following elements: (1) as in all federations, the union of sev­eral) autonomous political entities, or ‘States’ for common pur­poses; (2) the division of legislative powers between a ‘National Government,’ on the one hand, and constituent ‘States’ on the other, which division le governed by the rule that the former is a ‘government of enumerated powers’ while the latter are gov­ernments of ‘residual powers; (3) the direct operation for the most part, of each of these centers of government, within its assigned sphere, upon persona and property within its territo­rial limits; (4) the provision of each center with the complete apparatus of law enforcement, both executive and judicial; (5) the supremacy of the ‘National Government’ within its as­signed sphere over any conflicting assertion of ‘State’ power; (8) dual citizenship.”). See generally, for different views of judicial federalism: P. Kurland, Toward a Cooperative Judicial Federalism, 24 F.R.D. 481; O’Connor, J., Our Judicial Federalism, 35 Case Western Reserve L. Rev. 1 (1984-85): Warren, Federal and State Court Interference, 43 Harv. L. Rev. 345 (1930); H. Hart, Jr., The Re­lations between State and Federal Law, 54 Colum. L. Rev. 489 (1954); P. Bator, The State Court and Federal Constitutional Litigation, 22 Wm. & Mary L. Rev. 805 (1981); D. Shapiro, Ju­risdiction and Discretion, 60 N.Y.U. L. Rev. 543 (1985); Wagner, Restriction of Access to Federal Courts: The Growing Role of Equity, Comity and Federalism, 50 Temple L.Q. 320 (1977); Soifer and Macgill, The Younger Doctrine: Reconstruct­ing Reconstruction, 55 Texas L. Rev. 1141 (1977). Professor La Pierre has said that “[A]lthough lates’ rights is no longer primarily a refuge for scoundrels, it is often difficult to discern whether states’ rights proponents are motivated by some principle of federalism or whether they use states’ rights as a convenient legal mantle for objections to substantive national policies.” See, La Pierre, The Political Safeguards of Federal Redux: Intergovernmental Immunity and the State as Agent of the Nation, 60 Wash. L.Q. 779, 782-83 (1982). Field, Garcia v. San Antonio Metropolitan Transit Author­ity: The Demise of e Misguided Doctrine, 99 Harv. L. Rev. 84, 117 (1985). See, Tolman, Leland G., Colum. L. Rev., April 1954, pp. 650.657, quoted in W. Brooke Graves, American Intergovern­mental Relations (1964) (stating that “the very essence of fed­eralism, the arcs where Federal and State law touch and over­lap, is made integral in the national judicial structure to a de­gree greater than in any other federated government.”). 426 U. S. 833 (1976). 469 U. S. 528 (1985). Redish, Supreme Court Review of State Court “Federal” Decisions: A Study in Interactive Federalism, 19 Ga. L. Rev. 861, 874 (1985). E. Corwin, supra, at 22-23. See, Richard H. Leach, American Federalism (1975), at 15. See, Wisdom, Foreword: The Ever-Whirling Wheels of Ameri­can Federalism, 59 Notre Dame L. Rev. 1063, 1088-69 (1984). Redish, supra, note 25, at 880. R. Berger, Federalism: The Founders’ Design, University of Oklahoma Press (1987), at 65. Thus the act in a twofold sense is repugnant to the Constitution. It not only transcends the authority dele­gated to Congress over commerce but also exerts a power as to a purely local matter (manufacture) to which the federal authority does not extend. The problem with this approach is not so much that it is impos­sible to give meaning to the notion of a fenced-off domain of exclusively local affaire; there is no a priori reason to suppose that over time this concept should not be fleshed out as intelli­gibly as any other. The real and dispositive problem is that the enlace theory does not accurately reflect the Constitution’s plan for allocating power between the federal and state govern­ments. The Constitution in no way defines the content of any enclave of exclusive state authority—except, of course, by a process of inference from what is not on the checklist of federal powers. And the tenth amendment, sometimes, incredibly, cited in support of the state enclave approach, in fact flatly re­jects it. That amendment certainly proves what would have been obvious anyway, that the framers felt there were some powers that the central government was to be denied. But it could hardly be clearer that the question of what matters are to be left exclusively to the states is to be answered not by refer­ence to some enclave construction but rather by looking to see what is not in the federal checklist.”) (Quoting Hammer v. Dagenhart, 247 U.S. 251, 276 (1918)). Althouse, How to Build a Separate Sphere-Federal Courts and State Power, 100 Harv. L. Rev. 1485 (1987). Penhurst State School & Hospital v. Halderman, 465 V. S. 89 (1984). 392 U. S. 183 (1968). 426 U. S. at 855. Id. at 855, citing Maryland v. Wirtz, 392 U.S. at 205. Powell, supra note 24, at 1322. 426 U. S. at 845. Id. at 845 (quoting from Lane County v. Oregon, 74 U.S. 71, 76 (1868). Id. at 833, referring to United States v. California, 297 U.S. at 183-185, and quoting from Halvering v. Gerhardt, 304 U.S. 405, 416 (1938) (Stone, C.J.). Michelman, States’ Rights and States‟ Roles: Permuta­tions of “Sovereignty” in National Language of Cities v. Usery, 86 Yale L. J. 1165, 1169 (1977). The appellants‟ claim in National League of Cities was that “…when Congress sought to apply the Fair Labor Stand­ards Act pro­visions virtually across the board to employees of the state and municipal governments it “infringed a constitutional prohibition‟ running in favor of the Sates as States.” See National League of Cities at pp. 836-837. Among the appellants in National League of Cities were the cities of Cape Girardeau, Mo., Lompoc, Cal. and Salt Lake City, Utah. Mt. Healthy City School Din. v. Doyle, 429 U.S. 274, at 280. Michelman, supra, note 72, at 1171. Both Tribe and Michelman reach the conclusion that, de­spite the rhetoric of sovereignty in the National League of Cit­ies opinion, what the Court is really referring is to the roles and duties of the states in providing basic social services to their citizens. In this specialized meaning of sovereignty the social service role is treated as a part of the legal conception of what it mean to be a state. Michelman argues that “the state sovereignty invoked and canonized in the National League of Cities” obscures and twists the social justice considerations un­derlying he opinion. Tribe argues that the National League of Cities opinion supported individual rights claims and that “[t]he language of National League of Cities is indeed quite consistent with a protected state role premised on individual rights.” See, Tribe, Unraveling National League of Cities: The New Federalism and Affirmative Rights to Essential Govern­ment Services, 90 Harv. L. Rev. 1065, 1075 (1977). Wechsler, supra, at note 17, p. 560. But see, J.R. Schmidhauser, The Supreme Court as Final Arbiter in Federal-State Relations (Univ. of N. Carolina Press 1958) (advocating that it was the Framer’s intention that the Supreme Court be the final arbiter). J. Choper, The Scope of National Power Vis á Vis the States: The Dispensability of Judicial Review, 86 Yale L. J. 1552, 1621 (1977); Judicial Review and the National Political Process: a Functional Reconsideration o/ the Role of the Su­preme Court (Univ. of Chicago Press, 1980. J. Choper, supra note 76, at 1570. Wisdom, supra note 38, at 1063. Referring to the Court’s role of judicial review, Dean Choper also wrote “that when the Supreme Court, naïf without conventional political responsibility, says ‘thou shall not’ to acts of Congress, it usually cuts sharply against the grain of majority rule. The relatively few laws that finally overcome the congressional obstacle course generally illustrate the national political branches operating at their majoritarian best while the process of judicial review depicts that element of the Court’s work and that exertion of federal authority with the most brittle democratic roots.” Choper, The Supreme Court and the Political Branches: Democratic Theory and Practice, 122 U. Pa. L. Re. 810, 831 (1974). Field, supra note 27, at 114. Kaden, Politics, Money and States Sovereignty: The Judicial Role, 79 Col. L. Rev. 847, 849 (1979). Professor Rapaczynski has said that the sovereignty ap­proach t federalism was responsible for the poor intellectual quality of the dis­cussion of that subject and that the main thrust of the Courts deci­sion was “to reject the usefulness of the sovereignty based analysis and to replace it with a focus on the nature of the political process responsible for making the federalism-related decisions.” A. Rapaczynski, From Sover­eignty to Process: Jurisprudence of Federal­ism after Garcia, 1985 Supreme Court Review 341, 360. 469 U. S. at 557. La Pierre, supra note 28, at 984 (quoting Pennock, Responsive­ness, Responsibility and Majority Rule, 56 Am. Pol. Sc. Rev. 797 (1968). See generally, for criticism of Garcia: Van Alstyne, Com­ments, The Second Death of Federalism, 83 Mich. L. Rev. 1709 (1985); Howard, Garcia and the Values of Federalism: On the Need for a Re­current to Fundamental Principles, 19 Ga. L Rev. 789 (1985); Saur, Comment, Garcia v. San Antonio Metropoli­tan Transit Authority and the Manifest Destiny of Congres­sional Power, 8 Harv. J. L. Pub. Policy 745 (1985). Justice Harlan, referring to the contradictions in the Court’s treatment of Puerto Rico as an unincorporated territory in Downes v. Bidwell, 182 V. S. 245, 386. A group of cases decided by the Supreme Court in 1901 that deal with the status of Puerto Rico. De Lima v. Bidwell, 182 U.S. 1 (1901); Goetz v. United States, 182 U.S. 221 (1901); Dooley v. United States, 182 U.S. 222 (1901); Armstrong v. United States, 182 U.S. 243 (1901); and Downes v. Bidwell, 182 U.S. 245 (1901). For an excellent analysis of the Insular Cases, see Torruella, The Supreme Court and Puerto Rico: The Doctrine al Separate and Unequal (1985). J. Cabranes, Puerto Rico: Colonialism as Constitutional Doctrine (Book Review) 100 Harv. L. Rev. 450 (1986). Lowell, The Status of Our New Possessions-A Third View, 13 Harv. L. Rev. 153, 176 (1899). (“The theory, therefore, which beet interprets the Constitution in the light of history, and which accords most completely with the authorities, would seem to be that territory may be so annexed as to make it a part of the United States, and that if so all the general re­strictions in the Constitution apply to it, says those on the or­ganization of the judiciary; but that possessions may also be so acquired as not to form part of the United States, and in that case constitutional limitations, such as those requiring uni­formity of taxation and trial by jury, do not apply. It may well be that some provisions have a universal bearing because they are in form restrictions upon the power of Congress rather than reservations of rights.”). R. Carr, Puerto Rico: A Colonial Experiment (New York University Press, 1984), at 98. Helfeld, How Much of the United States Constitution and Statutes are Applicable to the Commonwealth of Puerto Rico, Paper prepared for the 1985 First Circuit Judicial Conference (Nov. 4, 1985). J. Cabranes, supra, note 102, at 458. … The idea that this country may acquire territories any­where upon the earth, by conquest or treaty, and hold them as mere colonies or provinces the people inhabiting them to enjoy only such rights as Congress chooses to accord to them is wholly inconsistent with the spirit and genius as well as with the words of the Constitution. People v. Bates, 258 U.S. 298, 909 (1922). The Court went on to exalt the case of Alaska, which in his view was a good case for incor­poration in the Union because its “enormous terri­tory” offered oppor­tunity for settlement by American citizens. Without such enormity of space or opportunity for settlement, the small ocean community of Puerto Rico was thought to be a very different case from that of Alaska. Thus, the older inferi­ority of the non-incorporated territory continued despite the trappings of the American citizenship bestowed five years ear­lier. Examining Board v. Flores de Otero, 426 U. S. 572, 596 (1976). Califano v. Torres, 435 U.S. 1, 3 (1977). Justice Marshall addressed these factors in the dissenting opinion. Referring specifically to the economic concerns he ar­gued that the Court’s reliance on the disruptive effect that greater benefits would have on the Puerto Rican economy sug­gested “that programs designed to help the poor should be less fully applied in those areas where the need may be the great­est” and that such reliance impulse “that Congress intended to preserve or even strengthen the comparative economic position of the States vis-a- vis Puerto Rico.” Rosario at 655-56. Justice Brennan had voted to affirm in Califano while Justice Marshall noted probable jurisdiction and would have set the Califano case for oral argument. R. Cappalli, Federal Financing in the Commonwealth of Puerto Rico, 39 Rev. Jur. U.P.R. 7, 103 (1970). Responses of the White House Task Force on Puerto Rico to the Subcommittee on Insular and International Affairs, March 14, 1988, p. 4. See, First Fed. S. & L., etc. v. Ruiz de Jesús, 644 F.2d 910 (1991), at 911. 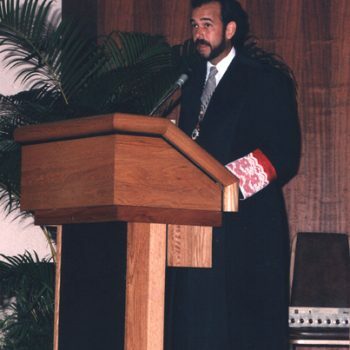 Judge, United States District Court for the District of Con­necticut; former General Counsel, Yale University and former Administrator to the Office of the Commonwealth of Puerto Rico and Special Counsel to Governor Rafael Hernández-Colón (19731975). J. Cabranes, supra note 102, at 480. See Helfeld; supra note 109, at 22-23. 4 J. Trías-Monge, “Historia Constitucional de Puerto Rico” at 217 (1983). Carr, supra note 108, at 9-10. Torruella, supra note 101, at 159. J. Cabranes, supra note 102, at 481.462. C. Friedrich, Puerto Rico: Middle Road to Freedom, (1969) at 77. P. Ortiz-Alvarez, the Compact between Puerto Rico and the United States: Its Nature and Effects, 91-92 Revista de Derecho Puertorriqueño 185, 282-283 (1984). 148. Id. at 287. U. S. v. López Andino, 831 F. 2d. 1164, 1168 (1987). Helfeld, Congressional Intent and Attitude toward Public Law 600 and the Constitution of the Commonwealth of Puerto Rico, XXI Rev. Jur. De la Universidad de Puerto Rico 255, 307 (1952). Mora v. Mejia”, 208 F.2d 377 (CA 1 1963) cited in Calero-Toledo v. Pearson Yacht Leasing Co.,94 S. Ct. 2080, 2088 (1974). Lewis, Puerto Rico: Freedom and Power in the Caribbean (1963) at 362.